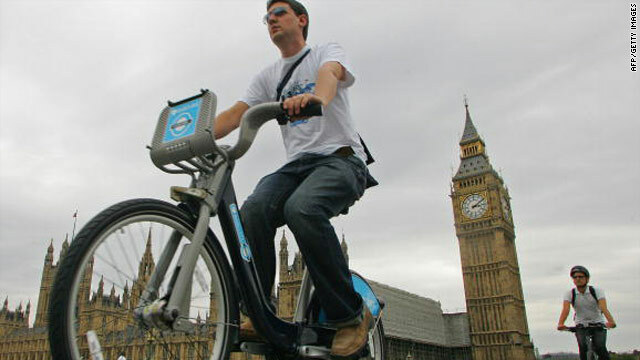 London, England (CNN) -- Red double-decker buses and black cabs have long been iconic symbols of London, but Britain's capital may soon become just as famous for its distinctive blue and silver rental bicycles. As its public transit system struggles to cope with growing passenger loads, London is starting to embrace cycling. This year it launched a new bicycle-sharing system that allows residents to rent a bicycle from hundreds of locations in central London. Government officials and cycling groups agree that unless London pushes itself to become one of the world's most bike-friendly cities, it will struggle to meet the demands placed on its rail, bus and underground networks. But cycling campaigners say the city has a long way to go before it has the infrastructure needed on its busy and sometimes dangerous streets to tempt enough people onto two wheels. "There's obviously a huge amount that needs to be done," said Chris Peck, policy coordinator for Britain's national cyclist group CTC. I've been cycling in London all my life and I've never in many decades seen as many cyclists on the road as there have been this year. "The state of the road network is still not very conducive for getting mass participation in cycling. There's still far too much motor traffic traveling far too fast for most people's comfort values." For novices, biking in London can be a daunting prospect. Heavy traffic, narrow streets with few off-road cycle paths, limited safe parking and the dozen or so cycling deaths recorded each year are all powerful obstacles to getting in the saddle. But enthusiasts say it's impossible to ignore significant changes that are pushing London in the right direction. The city has a cycling supporter in Mayor Boris Johnson, who has upheld many of the initiatives of his predecessor Ken Livingstone that are credited with bringing more bicycles onto the city's streets. "I've been cycling in London all my life and I've never in many decades seen as many cyclists on the road as there have been this year," said Tom Bogdanowicz of the London Cycling Campaign group. "It's a delight really." Central to London's cycle policy is a bike sharing program, modeled on similar ventures that have been successful in Paris and elsewhere. Some 6,000 sturdy two-wheelers have been deployed at "docking stations" around the city where they can be rented for short journeys. The cycles -- nicknamed "Boris Bikes" -- have become a success since they hit the streets in July. This week the city announced it would add a further 2,000 bikes before the 2012 Olympics. "I was a doubter, I thought it would never work," said Helen Pidd, a journalist for the Guardian newspaper whose recently published book "Bicycle" offers a guide for everyday cyclists. "You see people who haven't been on bikes for years riding them with smiles on their faces. There's an extra 6,000 bikes on the road and they're so distinctive. Taxis and cars are getting more used to seeing bikes and that can only be a good thing." For all the excitement and, in some cases, unabashed joy, that has greeted the arrival of the Boris bikes, they also bring to light a serious challenge facing London. With a population rise of one million forecast by 2025, existing rail and underground networks, already running at capacity during peak hours, will be incapable of meeting demand unless more commuters switch to cycles, says Bogdanowicz. "There's not much choice in this because London's population is going up," said Bogdanowicz, who cites official figures stating that a 5 percent of all journeys needed to by bicycle to satisfy transport demands -- more than double current figures. "They need that level of cycling just to keep the city going," he told CNN. Some cycling campaigners say London isn't doing enough. They say the city is ignoring safety issues and cyclists in the city's outer reaches and is focusing too heavily on "cycle superhighways" -- wide blue lanes painted along key road routes. "For me the cycle super highways are an expensive waste of paint," said Pidd. "If you want to encourage people to cycle more then you need to make it safer. Safety is the number one reason people give why they don't cycle. "These cycle superhighways go on the busiest roads in London, you've got juggernauts juddering past. I think if you're an inexperienced cyclist it's the last thing in the world you'd want to ride along." Kulveer Ranger, the transport advisor for Mayor Johnson, said critics should focus on the positive advances in cycling in London. He insists the capital is on track to become the "best cycling city in the world." "I don't doubt the fact that there's always more to be done, but I think we must acknowledge the hard work that has happened, the landmark changes that have been made," he told CNN. "We've just gone over 1.5 million journeys in past three months, and we're halfway through delivering a target of 66,000 extra cycle parking spaces. This is a fully comprehensive cycling revolution."